You are currently browsing the tag archive for the ‘APT’ tag. Given the size and significance of the Bungle Bungles, it is astonishing that this prehistoric formation was not on anyone’s radar screen until it was rediscovered from the air in 1983. The Kimberley is large and desolate, so perhaps it is not too surprising that the beautiful mountains got lost for awhile. There are plenty of other attractions in the area– Lake Argyle, the largest man-made lake in Australia, and the Argyle Diamond Mine, the largest diamond mine in the world. The mountains are only 56 kms (35 miles) from the Great Northern Highway, but the road is difficult, and the journey takes two hours. 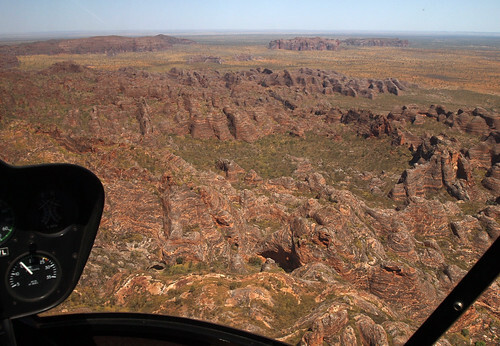 The Bungle Bungles are in what is now called Purnululu National Park. It is remote and still inaccessible to anything but 4 wheel drive vehicles, small airplanes and helicopters. 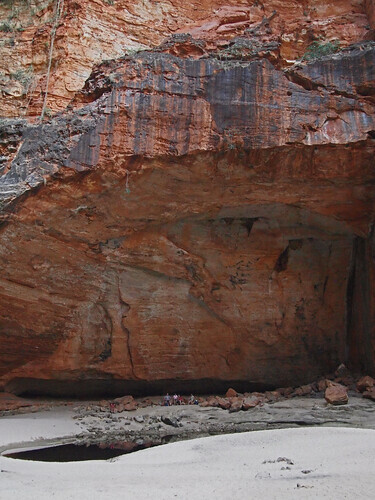 Prospectors probably discovered the Bungle Bungles in the 1880’s, but they passed on through. Due to sheer good luck, our visit coincides with some renovations to the campground ordinarily allocated to the likes of us by APT, the upscale outfit that maintains two camps here. We have been invited to stay in their main facility, and roughing it is not on the agenda. 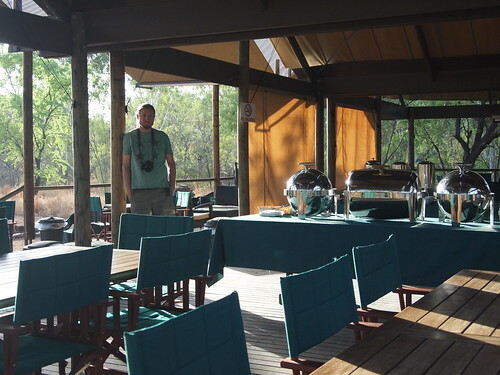 We check into semi-permanent tents with beds, lighting and ensuite baths with showers. Breakfast and dinner are sit down affairs, cooked and catered by the staff. Anthony, our driver/guide, cook, repository of local information, photographer, joke teller, nurse and bottle washer, hardly knows what to do with himself. The strange name of the range is mired in mystery. Purnululu is the Aboriginal word for sandstone. The beehive domes are all that remain of a large sedimentary rock mass laid down 360 million years ago. The domes were created by uplift, then erosion– over 20 million years of sculpting by rivers and wind. This is a World Heritage site, and the “beehive” domes are regarded as the world’s most exceptional examples of cone karst formation in sandstone. We are in a land of spirits, immense and intimate at once. The ancient river beds formed layers of sandstone, some with enough clay content to support cyanobacteria. The bacteria grows on the sandstone bands and holds moisture. The layers with less clay are more porous, oxidizing to reveal a rusty orange color. Silica adds white to the mix. 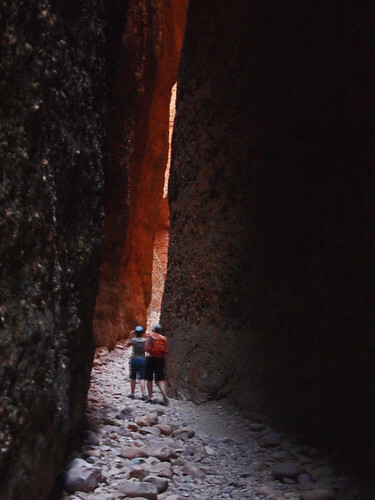 Our sojourn among the Bungles includes a visit to Echidna Chasm, Cathedral Gorge, and a walk among the domes at Piccanniny Creek. For those who are able and willing to spend the extra funds for a helicopter ride, there is an eagle’s view of the great domed massif. It is my second time in a chopper, and I am nervous, to say the least. There aren’t any doors and the pilot looks hardly old enough to drive. Despite my trepidation, our airborne journey passes safely, and I’m glad that images from the flight have been captured on pixels, at least. To the south of the Bungles is the great Tanami Desert. This is a semi-arid region, with a short, wet summer followed by a long, winter. The gorges protect the most southerly patches of rainforest found in the Kimberly, but it is an arid and fragile landscape. Its beauty is serene, seeming to emanate from the ancient rock. I can’t help thinking that it is fortunate to have been neglected for such a long time. May its remoteness and its status as a World Heritage Site protect it in the future. I feel blessed to have been there, a pilgrim in the sands of time.